Ismail:) Not that it would make a difference, except my new bride perhaps! Cannon moment:first time seeing one of my wives' face in broad day light..let me capture it !! Must post this as my new FLB 'Face-less Book'profile picture. "I wonder if they'll appear in the picture if I stay in this position. - Though, it took him a few hours to get back up once the shot was taken." Smile my beauties, Colgate is looking for a model for their campaign. "Show me those beautiful smiles!" Quick before the religious police get here!!! OOoooo LaLaa..... the one in the middle.....she's TOOOO HOT! 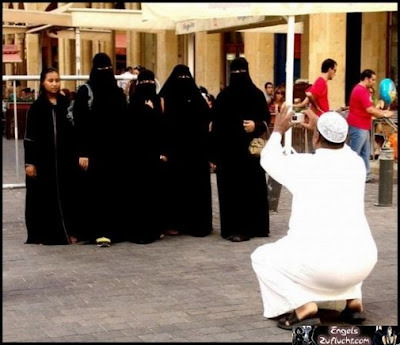 I'm sending this pic to Sarkozy to make him see sense-how could they ban the veil in his country? I clicked the pic 10 mins back-but I can't get up..
Little do they know- it's taking so long to click coz I'm letting off a big of gas while in this pose. How do you click on this thing? Is this a real picture!!? "make it fast oldy!! the boys in red r running.. "
LP what was the point of taking such a picture? The people in the photo could have downloaded one from the net and used it - who would guess it isn't them? Well..it is just in jest..I guess..